It can seem as though the windows in a home are intended to serve aesthetic and functional purposes, and this is certainly true. However, many people are not cognizant of the fact that they have a lot to do with energy consumption related to heating and cooling systems. According to the United States Department of Energy, windows account for about 30 percent of energy usage. A great deal of money is unnecessarily lost by homeowners that have old, outdated, energy inefficient windows. State-of-the-art solutions are readily available, and there is a certain blueprint that is followed to manufacture windows that provide maximum efficiency. Decades ago, single pane windows were the norm, and they do nothing to provide thermal insulation. At the present time, double pane windows are widely utilized, and triple pane windows are available as well. The better windows are treated with a Low-E coating on both panes of glass, and this keeps the heat outside during the summer, and it contains indoor heat during the winter months. 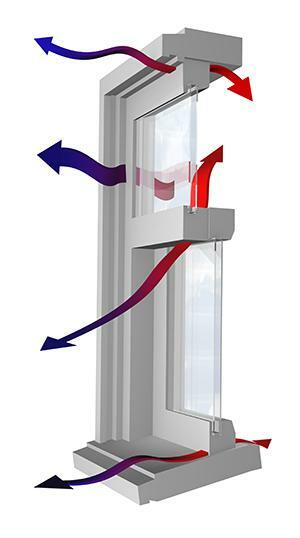 There is a gas fill between the panes of glass, and it is treated with a desiccant to absorb moisture. The desiccant also limits condensation, and the tightly sealed-in argon or krypton gas fill provides maximum insulation. The U.S. Environmental Protection Agency established the ENERGY STAR® certification program in 1992. When it comes to windows, their certifications are based on data that is gathered by the National Fenestration Rating Council (NFRC). When a replacement window carries the ENERGY STAR® label, you can be sure that it has been manufactured in accordance with stringent energy efficiency standards. There is another certification that consumers can look for when they are purchasing replacement windows. The American Architectural Manufacturers Association conducts performance tests on windows and other architectural products. They test for resistance to wind pressure, water intrusion, and air leakage. Their experts also test each window component individually, and they test the thermal performance of windows. Products that carry the AAMA certification have been thoroughly examined inside and out by very discerning professionals.